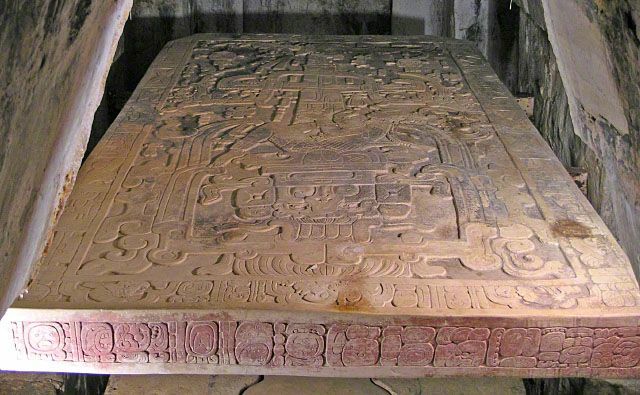 I'm glad to provide you with a rare glimpse of the famous sarcophagus lid of Palenque. Like more and more ancient sites all over the world the tomb and therefore the lid has very limited access to the public. As of 2005, if you want to visit the tomb, you have to apply for a permit months in advance as a very limited number of permits are given out every month. If you are able to visit the tomb and want to take photos, you better bring good equipment as the lighting is rather dim. Update 2013: It is no longer possible to visit or photograph the tomb or the sarcophagus lid. Permits are no longer given out to the public. So the photos you see below are historic. Despite many attempts to "debunk" the PaleoSeti Theory in terms of the sarcophagus lid and attempts of archeologists to find more down-to-earth explanations, I'm still convinced that the lid shows a technical scene misinterpreted by the ancient Maya. It's not just the lid that points to this, it's also the mask of Pakal himself, which was found inside the sarcophagus, that leads me to that conclusion. See below for more info. Once you pass the "permit hurdle" you can climb down deep inside the interior of the pyramid. You decend a bunch of dimly lit, narrow corridors. This is nothing for claustrophobic folks. The heat and humidity leave no part of your body and clothes dry. 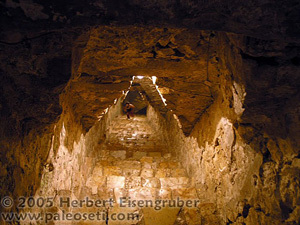 In order to relief the tremendous weight of the pyramid above, the ancient architects chose the very stable triangle form of passages and the tomb. 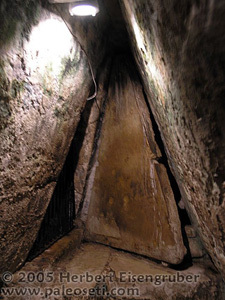 Even the door to the tomb itself is triangular. One can't enter the tomb itself - not even with the permit - it's locked with bars and chicken wire like material. During my visit there was a hole in the wire, just big enough so I could stick my camera lens through. I'm acutally not sure if taking photos is allowed, but the guard that accompanied me had to use the washroom, so I was about ten minutes alone with the lid. No other tourists, just myself and this iconic piece of archaeology. After many years of dreaming about visiting Palenque and the lid, this was a special treat for me that I will never forget for the rest of my life. Update 2013: It is no longer possible to visit or photograph the tomb or the sarcophagus lid. Permits are no longer given out to the public. And here is what you will see if you get the chance to visit. Like I said, photographs like these are rather rare. 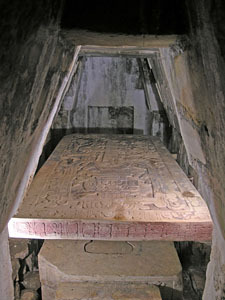 The famous sarcophagus lid of palenque. The tomb and the lid are at the heart of the pyramid of the inscriptions. In fact the pyramid was built around the tomb, so moving the lid out of the tomb is impossible. If this wouldn't be the case, Im convinced that the lid would have been gone already. Please click on an area of the lid that interests you and you will get an enlarged view. Below: An artists (unknown artist) rendition of the entire sarcophagus lid as seen from the top. On the left you see the death mask of Pakal the great, the ruler for whom the tomb was built. 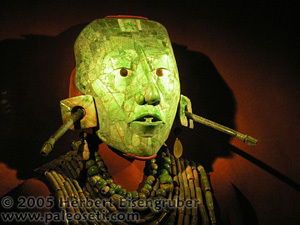 The mask is complete made from Jade and is now in the Museum of Anthropology in Mexito City. Please click on the photo and look at the face closely. When was the last time you have seen a human being with it's nose starting that high on the forehead? I don't think that just an artist's rendering as other depictions of Pakal show the same facial features. (Below left, Credit: A. Skromnitsky, Wikipedia Commons) I traveled extensively through Mexico and I have seen the same facial features in the proud Maya people of today except the nose that starts in the middle of the forehead. Was Pakal the last direct decendant of ancient astronauts? Did his facial features indicate that? Did the Mayans of Palenque put all their memories of their gods onto the sarcophagus lid when the last descendent of the gods died? As I said somewhere else on this website there is a worldwide trend to lock down OUR archaeological treasures of the past and only make them accessable to a VERY small elite archaeologists that literally hold the key. Everywhere in the world the argument is being made that tourists are damaging the ancient treasures beyond repair. While I agree that great care should be taken in preserving our archaeological treasures and access should be controlled, it is completely unacceptable to make them completely unaccessable to the public. In a discussion with an archaeologist who doesn't want to be named on this site, she made the argument that replicas serve the same purpose for the interested public without putting the original artifact in danger. Well, that sounds good in theory, but I have to ask the question why the galleries of the world display REAL Picassos, Rembrandts and DaVincis... The answer is simple: Because a copy or a replica is not the real thing. Nobody would visit the Louvre in Paris, the British Museum in London or the Metropolitan Museum of Art in New York if they would know that all the items displayed are replicas. Another aspect are the replicas themselves. The quality of some of the replicas are just plain shameful. The best example for this is the replica of tomb and sarcophagos lid of Pakal that is displayed in the Anthropology Museum of Mexico City. Advertised as "1:1 copy of the real thing" you can judge for yourself by the photo comparison on the left. Top the real thing, bottom the replica. Isn't it a good replica? Really hard to tell them apart, huh? Sorry for the sarcasm. - Pay guards well to protect the sites and educate them. This creates meaningful jobs and is great for the local economy. - Limit the number of visitors per day if you must, but don't take away the chance to see a world heritage treasure. - If there is electricity to run lights into a space, there is also electricity for a de-humidifier if you are worried that humidity caused by visitors damage the artifacts. - If the artifact is so fragile that it can't be displayed, make a GOOD replica, that is a perfect copy of the original. The past belongs to all of us, not just a few. We all have the right to see our human history as it REALLY was, not as you replicate it for us out of paper mache with a meager budget. Ancient Astronaut Theorists like me always get critizised that we only see what we want to see and rip things out of context. We ignore other, similar finds and never talk about them. And they claim the Sarcophagus lid of Palenque is a prime example for this. Just by showing similar examples of items that we claim is proof of an extraterrestrial visit in the past, critics of the PaleoSeti Theory debunk the Theory. Case closed, let's move on. Well, let's have a look at this and put all the cards on the table. Let us take a look at the iconography on the lid, compare it with other similar depictions and see if the Ancient Astronaut Theory can hold up or if we really have to "close the case". In defence of the critics I have to say, though, that what I'm doing here is very rare and I would like to see this done by other Ancient Astronaut Theorists as well. The credibility of the Theory would increase enormously. I had this friendly and constructive discussion with an archaeologist friend of mine a few years ago on an archaeology forum. In my opinion this conversation was what should happen more often between Ancient Astronaut Theorists and "Official" Archaeology. The discussion that I recorded is very interesting I think and it explains the official view as well as my theory on the sarcophagus lid of Palenque. The Archaeologists opinions are in orange, my views are in green. Central on the lid is Pakal the great, ruler of Palenque. His body is depicted in a peculiar way that we think symbolizes rebirth, but he is resting. Makes sense as this is a tomb. Next we see the "tree of life" growing out of Pakal's body. The tree of life is a symbol often seen in Maya mythology. Wow, I'm surprised! Yes, exactly what I'm talking about. Those are actually good examples. Next you see on top of the tree of life the Quetzal bird which had special meaning to the Maya as it represents the sky and the heavens. That's why it sits on top of the tree of life. Good. Now let's see what is underneath Pakal. First we have to know that Pakal that the whole lid depicts Pakal's decent into the underworld. Therefore underneath Pakal we see a lot of symbolism that is connected to the Mayan underworld. He is falling into the mouth of a monster or a serpent. We can see the sungod, half skeletton, half flesh. Typical for Mayan iconography. At the very end you see hairs of the doubleheaded serpent that wraps around the whole scene. The hair are also typical and can be seen in many other depictions. There are a few other details on the lid. I could talk much more about, but for now I want to hear what you have to say. But just so much. The iconography on the lid is consistent with everything else we found in the Mayan world. Nothing on the lid is out of the ordinary. We don't need spaceships or Aliens to explain it. If you think different, well the burden of proof is on you. I think our knowledge and explanation of the lid is pretty solid. Ok, before I answer you with the Ancient Astronaut Theory I would like to ask you some questions. Is what you just told me undisputed among archaeologists? [laughs] Nothing is ever undisputed among archaeologists. There are some variations of the explanations of some symbols etc. But what I told you is the most respected interpretation. Do you share it 100%? Yes, but maybe 95%. There is always room for "adjustments"
I know you are open minded, otherwise you wouldn't talk to me. How many books about the ancient astronaut theory have you read? I have to admit, none. But I know you guys say it's a spaceship or rocket of some sort. I know what evil things you can say to me right now and where your question is leading to. One shouldn't talk about things we don't know. But like I said the burden of proof is on you as you are the one with the exotic theory. [laugh] That's no at all what I was getting at. I just wanted to know where I have to start with my explanation. Can we agree that final proof will never be achieved in archaeology, no matter what the theory is. There could always be the next find that disproofs it all? Yes, one could say that. With certain things this would be very unlikely, though and I have a feeling the lid is one of them. Yes, back to the lid. Have you seen another one like it in the Mayan world? In it's entirety, no. Pieces and parts of it many times as I explained above. 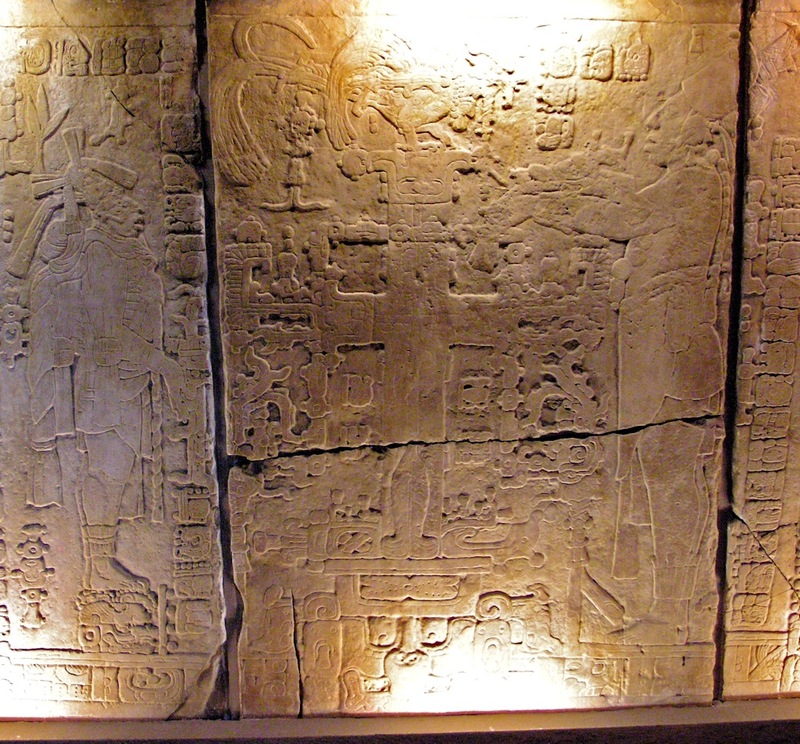 But the lid of Palenque is unique in it's completeness and arrangement. It is really stunning. So, am I correct in saying that the symbols of the lid are common Mayan symbols, but the arrangements of them in it's entirety is unqiue? I The above photo is called a photo mosaic. It's a collection of hundreds of photos from a Mexico trip I did. 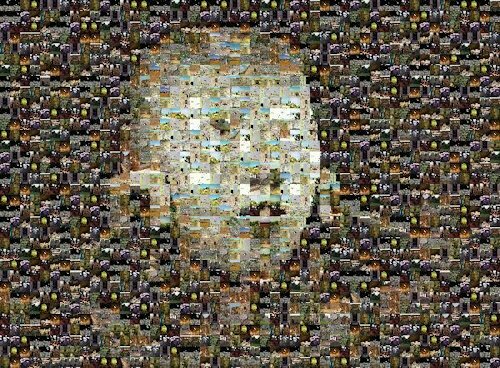 The photos are arranged in such a way that it shows Pakal's deathmask when you zoom out. If you would zoom in, you would see small photos that have nothing to do with the deathmask. Cute. Computer trickery! And? Your Point? I'm getting to it! Patience, please! Now I have a different photo for you. Not Mayan, but ancient nevertheless. I'm not sure if you are familiar with it. Oh, another "looks like" puzzle? Kind of. Looks like somebody riding a bicycle, doesn't it? At first glimpse, yes. But I'm sure you have to know the symbolism of the culture in question. Looks Asian. Indonesia or Vietnam. You have to know the meaning of the flowers etc to decipher this image and what it means. It would also be helpful to know the mythological background etc. It's from Indonesia actually. But I'm sorry I tricked you a bit. I know that's not the way to do things, but it's necessary to get my point across. And since you put the burden of proof onto me, I guess I'm allowed. The above carving is actually not ancient. It is from the 1920s or 30s on a realtively new temple. It shows a new invention that the Dutch colonizers brought with them when they arrived in Indonesia. The natives where so fascinated by it that they carved it in the temple. Unfortunately the carver had not the slightest clue what a bicycle was or how it worked. All he knew is that is was beautiful. What is beautiful and round (like the tires of the bicycle)? Flowers. And so on and so forth. In this instance we KNOW this is a bycicle it not just looks like one. You got me there! But I still don't get what that has to do with the Palenque lid..
KThe above carver from Indonesia saw something real, that he didn't understand. He tried to depict it. But the only way he knew how is to carve thing he knew. Symbols and things he was familiar with. 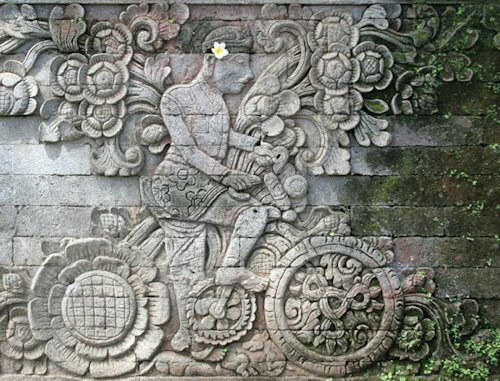 Wheels became flowers, spokes became a Mandala like object that is - I'm sure of it - seen in many drawings of ancient Indonesia. The Palenque lid is just like the bicycle of Indonesia. It is a technical apparatus of some sort that the ancient Maya didn't understand. So they used symbols and pictures they were familiar with. The Quetzal bird is on top, because the apparatus was flying. The smoke became hair etc. 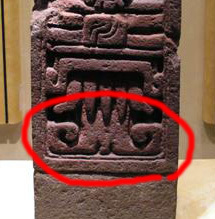 You are correct with what you are saying that the symbols of the lid are common Maya symbols found in many other places. It's the arrangement of those symbols that make the lid unique as you said yourself before. The way Pakal is lying, the way the "tree of life" grows out of his body. It's not the symbols themselves, it's their unique arrangements. I'm sorry, but you can't argue like this. You are still missing the context of the ancient Mayan believes and their context to the lid. Yes, I can argue like this and I just did. Right now I'm not talking about Mayan believes, I'm talking about the lid. I'm sorry to get a little bit agressive now, but I don't mean disrespect. But I find it always very interesting how archaeologist "unpack" ancient believes when they need them. While at other times when we have ancient myths like the story of Kukulkan who came in a feathered serpent from the stars and brought knowledge is just that. A story. Very convenient. But I don't want to stride away from the lid. I have another question for you. Underneath the lid there was a sarcophagus. And I think while the sarcophagus lid got a lot of attention in the last decades, the death mask of Pakal is just as interesting. Have you examined the mask closer? Yes, but for now I would like to talk about the mask for a second, if you don't mind. When have you ever seen a face like this? Really? I have traveled through Mexico extensively and never came across any individual who's nose bone starts in the middle of the forehead! You? What are you saying? The mask shows an extraterrestrial? Now I heard it all.. I didn't say that. I asked you if you ever seen somebody in Mexico or any other place who's nose bone starts in the middle of their forehead? C'mon! The mask of Pakal is a masterpiece. You know that! It is exquisit. All proportions are correct. You can't be seriously saying that the artist got his nose wrong. 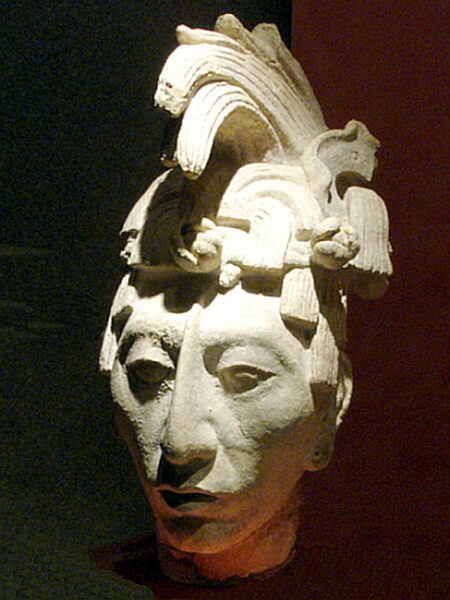 Besides there are other depictions of Pakal showing the same odd nose. Please do :) But back to the lid. I would like to propose a thought experiment if you don't mind. Let's assume for a moment - humor me - that I'm right. 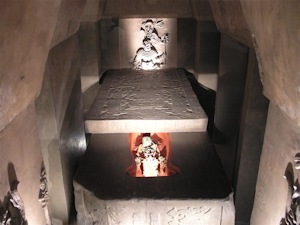 The sarcophagus lid of Palenque depicts a technical machine of extraterrestrial origin. Could be a rocket, spaceship, airplane or whatever. What is was is not important at the moment. But it was something the gods brought with them and the Maya didn't understand. 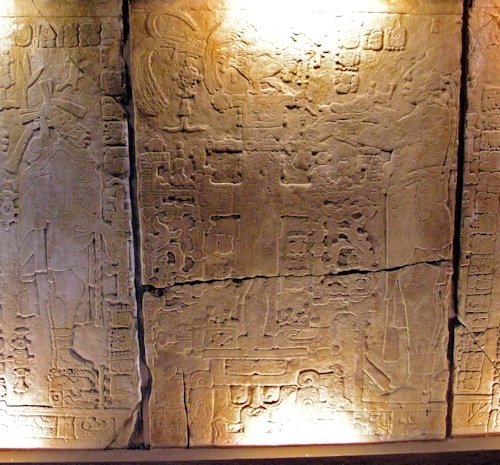 Pakal was a direct decendent of those gods, maybe the last one. The Maya didn't know exactly what this machine was, they didn't understand it. But they depicted it as good as they good. For this depiction they used their symbology or - what is much more probable - pieces of this machinery actually created the symbolism of the Maya. Man, you have quite the fantasy! I have quite the fantasy? Excuse me, I was not the one telling a story about double headed serpents, that had beards and ate Pakal - who's belly grew a tree with a bird on top - on his way to the afterlife, guarded by a sungod, half skeletton, half flesh. Compared to your's my story is actually "down to earth". But let me finish my thought, please. So we assume the lid depicts ancient extraterrestrial machinery. I think this machine would be central in Maya religion. There wouldn't be just one depiction of it, there would be a few. Otherwise it would be very unusual. To make a long story short, I think I found just that. Another depiction of Pakal's "spaceship" (or whatever it was) with Pakal and a helper standing next to it and maintaining it. The engine is turned off that's why there are no flames - hair of the serpent or whatever - on the bottom of the carving. Here it is. 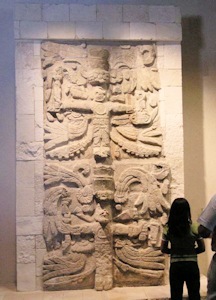 Photographed in the Anthropology Museum in Mexico City. The image is fainter then the sarcophagus lid, but everything is still clearly visible..
Again, the beard hair of the Sungod? Well, the beard is rather low and it doesn't really seem to be connected to the face, wouldn't you say? It's an artist's rendition. There are always variations. Ok, so I would like you to focus on the lower part of the image. Below the "beard". I don't know. Looks like some ornament. I can tell you what it is! It's the turbulence from the exhaust hitting the ground. The Maya were such good observers, they got it exactly right! It all makes sense! The rest of the discussion was not about the sarcophagus lid anymore. Other forum members chimed in and said I had a point. From then on, everything was about me not having the qualifications to say something like that and the experts studying for years while I just take photos and so on and so forth. In short the discussion went personal, like they do most of the time, unfortunately. I'm posting this example to show that I do know the official exaplanation of the lid and I'm NOT ignoring it. You heard the two explanations now and you judge for yourself which makes more sense.